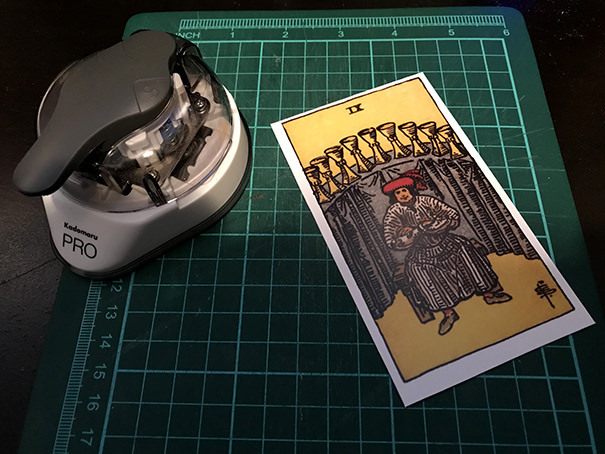 Start by positioning a card in the cutter so that the line where the border meets the artwork is lined up with the cutting blade. 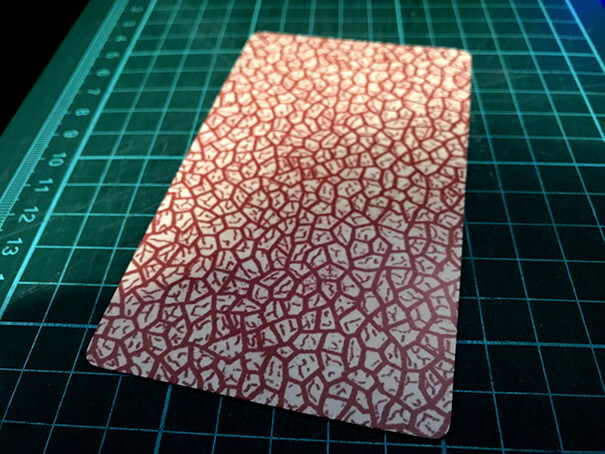 I use the card to place the straight edges so that the sides of the cutter and straight edges form a template I can place the cards into for cutting. Using this method requires going through the deck 4 times, once for each side being cut. 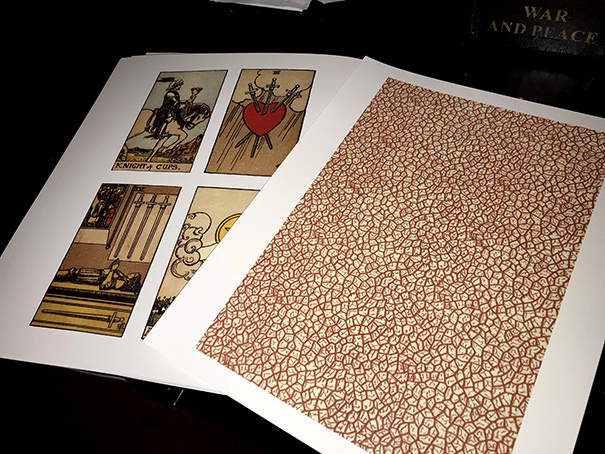 I pull a few cards from the deck and slip them into the template to check the border/artwork alignment. Once I have made sure that I have things adjusted so that the maximum border is removed and the maximum artwork is maintained, I’m ready to start trimming. 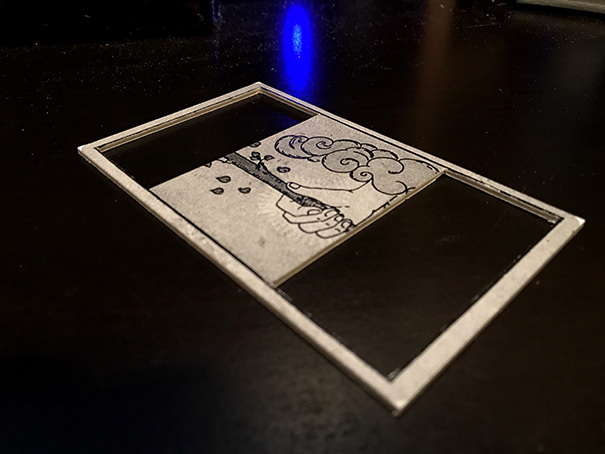 When it’s done, I go through the deck one more time, inserting each corner of each card into a 1/4″ corner cutter to trim off the points and makes rounded corners. Your deck is now ready to be enjoyed, unless you want to add some gilding to the cards or edges. 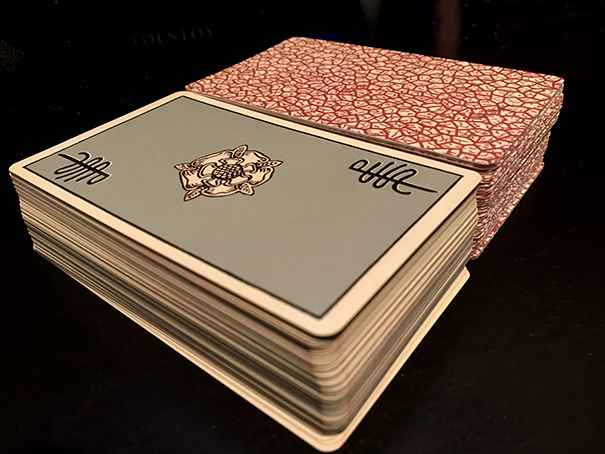 Many like to color the edges of the cards instead of leaving them white. 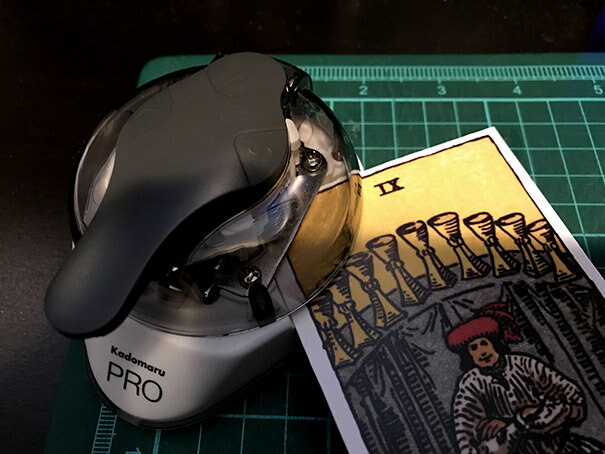 It creates the finishing touch that gives the cards an elegant aesthetic. It is easier to use a jumbo or a medium size permanent marker with a chisel tip. This wide chisel tip prevents accidental marks that can occur when using a non-chiseled tip. Since it is perpendicular to the card, it’s rather fool proof. 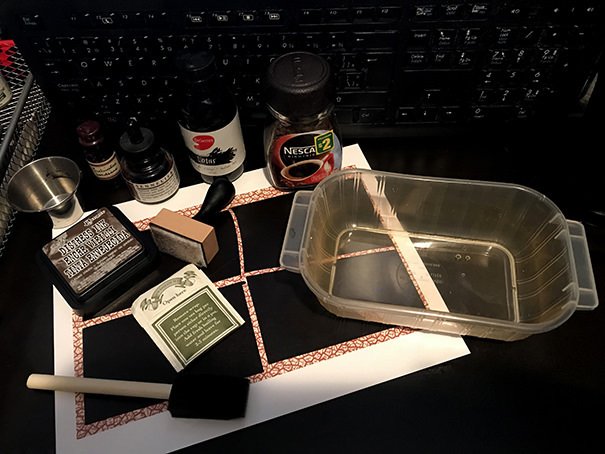 It’s important that you ink one card at a time. 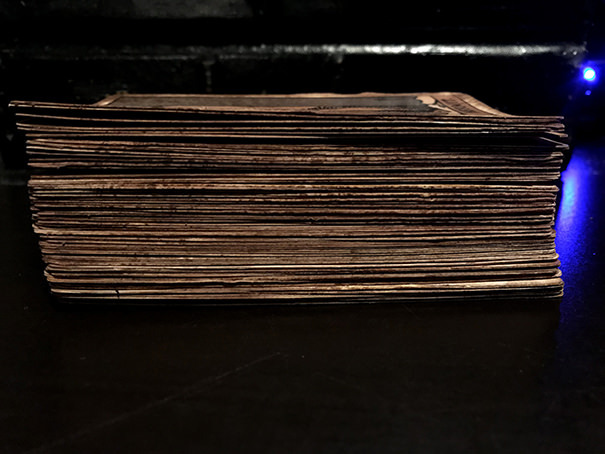 It doesn’t take that long and it will eliminate any bleed through that may happen from trying to ink all the cards’ edges in a stack. For the color to use, keep in mind that it’s best if the borders on the front and back match. A good testing method is to try it on a test or title card first if your deck came with one. 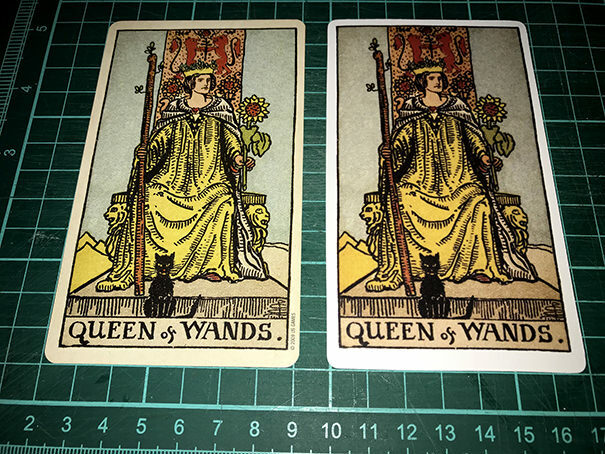 I did my own Tarot Spread! 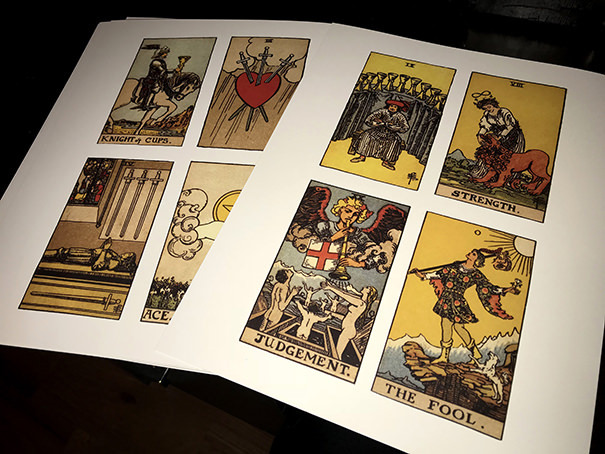 Since the past two months, I study a lot about Tarot, and I’m mainly using the Rider-Waite Tarot deck tradition (1910). 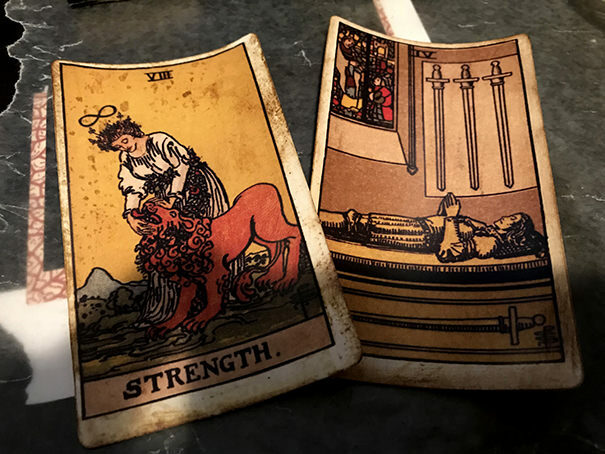 I still love the Tarot of Marseilles, but the minor arcana are pips cards that needs to be interpreted with numerology, so it’s easier for me to connect with the intuitive Rider-Waite. 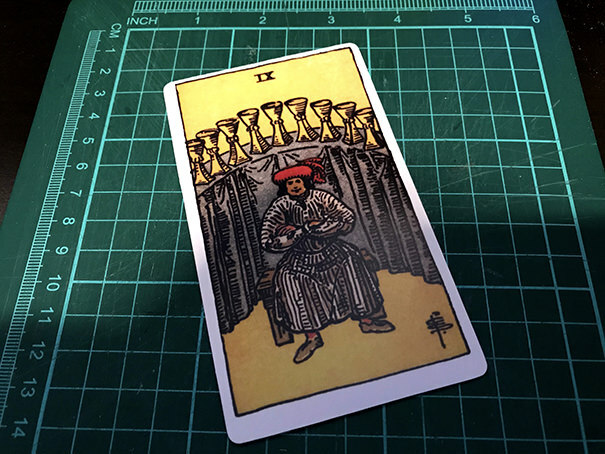 Maybe later I’ll study other traditions, like the Visconti-Sforza Tarot, the Sola-Busca Tarot, the Thoth Tarot and the Golden Dawn Tarots (3 versions). 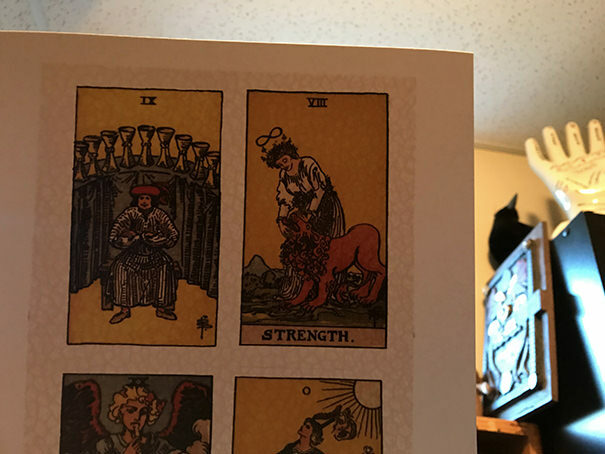 Anyway, I’m now at the point of being very comfortable with tarot. 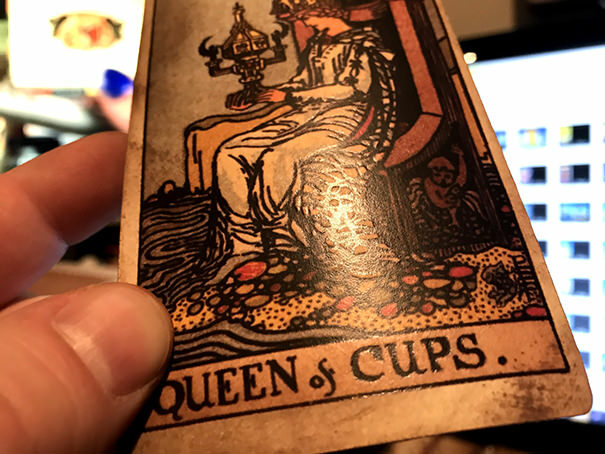 I do Tarot readings for others, without the help of any books or notes. I know all 78 meanings, not by memorization, but by understanding. I also includes reversed cards and relations with proximity cards. Yes, I can do all that after two months! 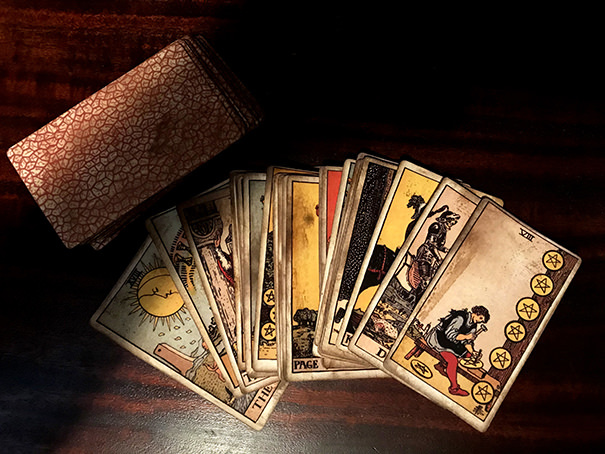 The key is to devote yourself entirely to the study of Tarot, every day, and voilà! So, what is the next step? 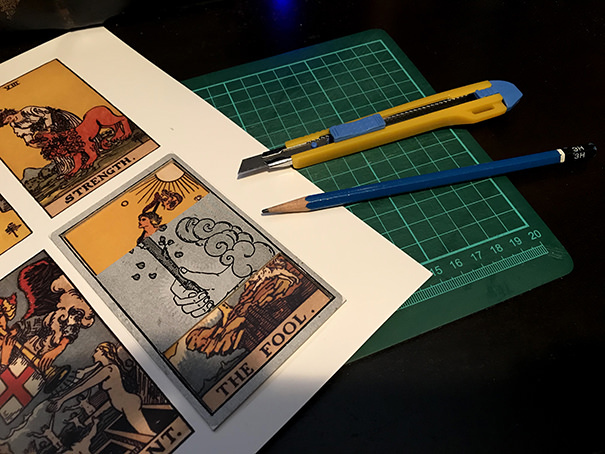 Well, today, I designed my own Tarot Spread! I’m calling it the Morsoth’s Druidcraft Spread and it is using only seven Cards. I created it for deepening my spirituality by focusing on the three Celtic Realms (Druidry) and the five Directions/Elements (Witchcraft). This spread can be very simple, and majorly complex depending on how we look at it. You can simply sort seven cards based on the layouts, and read the meanings based on the location of the cards. You don’t even have to think about a question, the cards will explain your spiritual growth by themselves. However, you can get truly deep if you analyze the layout, connected with the Cardinal Directions, the Elemental Energies, the Celtic Realms, and our Timeline. 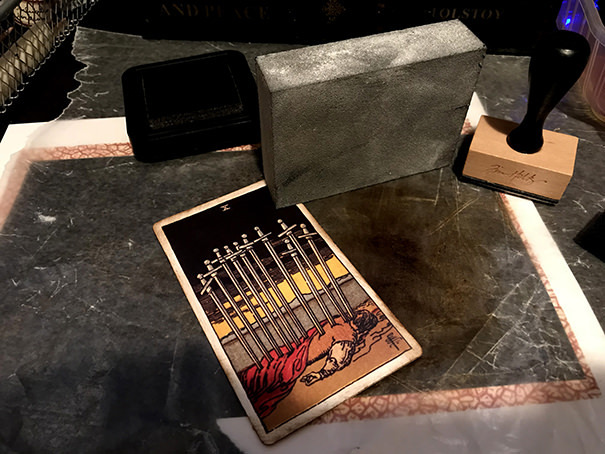 This spread can certainly be used for Shadow Work. 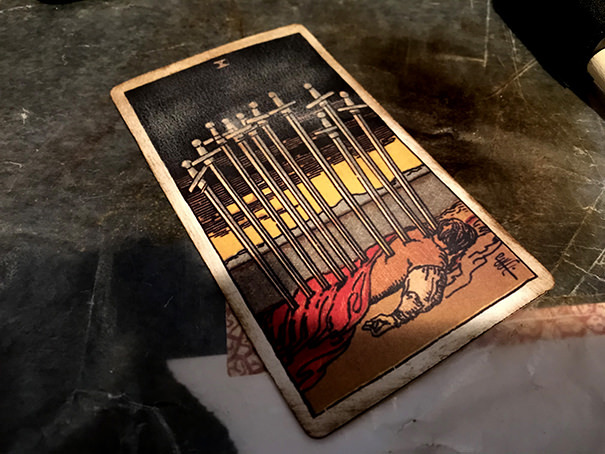 The cards shows us our current situation, they delves into our past to shows us what we should fix, and they suggests what we should improve in our lives. Card 6: Wisdom Advice – What should I fix? Card 7: Spiritual Advice – What should I do? On the picture, the three Celtic Realms are represented by shades of grey – light grey for the Land, dark grey for the Sea, and white for the Sky. The Celtic Land is divided in five regions or sections. The middle is a neutral zone, the center of our world. The card in that position (card 1) represents our current situation. It can be about anything going on in our life right now. 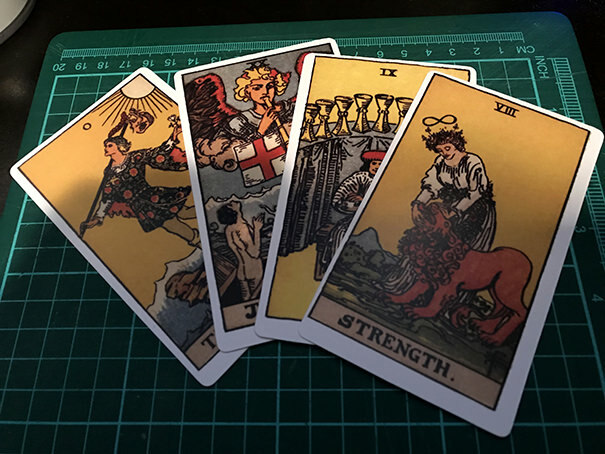 The four other cards surrounding the first card are connected with the four cardinal directions and influenced by their elemental energies. Card 2 located at the South represents Fire and Mental Energy (what passionate us), card 3 located at the West represents Water and Emotional Energy (what wounded us), card 4 located at the North represents Earth and Physical Energy (what obligates us), card 5 located at the East represents Air and Spiritual Energy (what inspires us). The Sea is inhabited by the Ancestors, the ones that once lived but are now things from the past. For this reason, any card (cards 3 and 6) touching this realm is also connected with the past. The card 3 is located between the present and the past, so it represent a current emotion affected by our past. The card 6 is a message from the Ancestors, a wisdom advice for something from our past that we should fix. The Sky is inhabited by the Deities, the ones that offers us omens for our possible future. 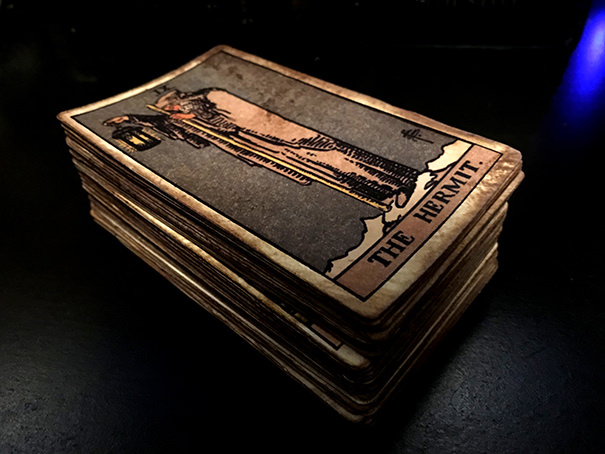 For this reason, any card (cards 5 and 7) touching this realm is also connected with the future. The card 5 is located between the present and the future, so it represent a current emotion influenced by our future. The card 7 is a message from the Deities, a spiritual advice for something we that we should do for our future. If you use it, please tell me your experience with it. Do you think something should be different?